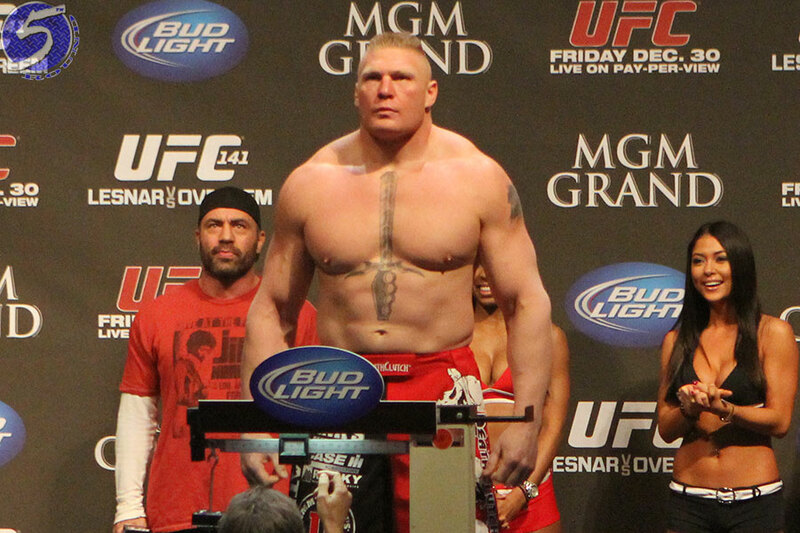 As the great Yogi Berra once famously said, “It’s like déjà vu all over again.” For the second time in three days, the U.S. Anti-Doping Agency (USADA) has informed former UFC heavyweight champion Brock Lesnar (pictured) that he has flunked a drug test. Unlike the out-of-competition drug exam Lesnar failed on June 28, this one was for an in-competition screening conducted by the USADA on July 9, the night Lesnar dominated Mark Hunt at UFC 200 for a lopsided unanimous decision victory. “The UFC organization was notified today that the U.S. Anti-Doping Agency (USADA) has informed Brock Lesnar that his in-competition sample collection from July 9, 2016, at UFC 200, has tested positive for the same substance as his previously announced out-of-competition collection on June 28, 2016,” the UFC expressed in Tuesday’s official statement. “USADA, the independent administrator of the UFC Anti-Doping Policy, will handle the results management and appropriate adjudication of this case. It is important to note that, under the UFC Anti-Doping Policy, there is a full fair legal review process that is afforded to all athletes before any sanctions are imposed. The Nevada State Athletic Commission also retains jurisdiction over this matter as the sample collection was performed at UFC 200 in Las Vegas. It is currently unknown what illegal substance(s) Lesnar had in his system. The Nevada Athletic Commission, the governing body that sanctioned UFC 200, will reveal that during a hearing at a later date. After the USADA announced Saturday Lesnar tested positive on his June 28 test, Lesnar released a brief statement to the AP insinuating his innocence. “We will get to the bottom of this,” Lesnar professed. The WWE offered Lesnar as a “one-off” loaner to the UFC in order to headline UFC 200. Because of how things played out during the top secret negotiations between Lesnar and the UFC, the 39-year-old Lesnar was granted an exemption from the UFC and USADA, the third-party company the UFC hired last July to conduct year-round drug tests on their entire roster, regarding a fighter’s four-month holding period after announcing his return to MMA. Lesnar passed all of those out-of competition tests except for the June 28th exam. In-competition drug tests are administered either six hours before or after a fighter’s contest. Lesnar is facing a fine, at least a two-year suspension and having his win overturned to a no contest. However, if Lesnar chooses to never fight again, the NAC can’t force him to pay any fine since he won’t peruse a license in the future.